In a year marked by ongoing volatility in global dairy markets, which in turn impacted farmers right across the country, 2018 was a year of overall achievement and progress for Aurivo – the globally-focused Agribusiness, headquartered in the North West of Ireland. – Aurivo’s focus and achievements in 2018 were grounded by the Co-Op’s Engage 2022 strategic growth plan, which in turn is underpinned by the Group’s €48 million five-year capital investment programme that was announced in 2018. The ongoing investment programme, designed to enable innovative new product development and to further position the business to meet global demand and anticipated market growth in the years ahead, incorporates a range of projects across the Co-Op including the extensive €26m upgrade of the Diary Ingredients facility in Ballaghaderreen Co. Roscommon. – Working to deliver on the goals of Engage 2022, Aurivo saw changes to its leadership on its Executive Team with the senior appointments of Sheila Maloney to General Manager of Aurivo’s Agribusiness and Marilyn Phillips to Group Head of HR. Stephen Blewitt in turn was appointed to lead Aurivo’s Dairy Ingredients and Consumer Foods business. 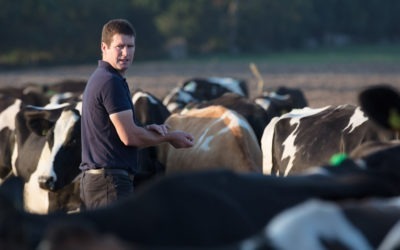 – To assist our suppliers with the challenges they were facing in 2018, Aurivo launched the innovative MilkFlex Loan Scheme which offered dairy farmers, flexible, competitively-priced financing. 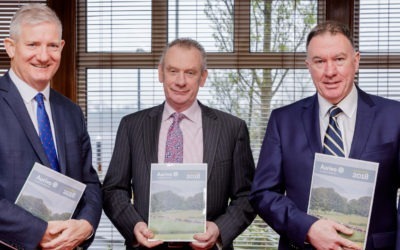 – With price volatility being a feature of 2017 also, it was gratifying to see that within the KPMG / Irish Farmers Journal Annual Milk Price Review announced last July that Aurivo has lead its neighbouring Co-Ops for four of the past five years on milk price. 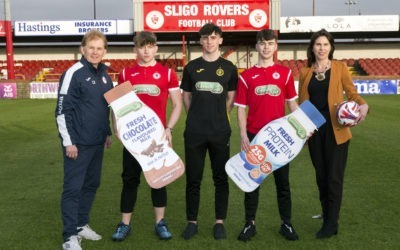 – A good example of Aurivo’s ongoing produce development and innovation was the launch in September of Connacht Gold MÓR Milk, a fresh and nutrient-rich whole milk specifically formulated for children from 1-12 years. Aurivo Consumer Foods was named Best Dairy Supplier at the Checkout ‘Best in Fresh’ awards, before scooping the prize for Best Chill & Fresh Supplier at the Barry Group Awards in September. In early October, there were four wins at the Blas na hÉireann awards. Aurivo’s Connacht Gold Creamery Butter was awarded silver in the Dairy category, while its Connacht Gold Softer Butter took bronze in the same grouping. In the Flavoured Milk category, the Co-op won silver for Dunnes Stores Chocolate Flavoured Milk and bronze for Dunnes Stores Strawberry Flavoured Milk. Dunnes Stores uses milk supplied by Aurivo to develop its own brand products. The Mums and Tots Awards, also in October, saw Connacht Gold MÓR Milk being named Best Follow on Milk. Aurivo Consumer Foods was also named Supplier of the Year at the Tesco Fresh Supplier Awards. – Aurivo’s Charity of the Year programme is an important part of its Corporate Social Responsibility and Origin Green sustainability strategy. During 2018 Aurivo employees fundraised for Down Syndrome Ireland’s local branches across the North West region as part of the Co-Op’s Charity of the Year programme. – For the second year Aurivo coordinated the Gaffney and Mulleady Agriculture, Food and Nutrition Scholarship which was established in memory of Paddy Gaffney and Sean Mulleady who died tragically in 2013.